Once per turn: You can detach 1 material from this card, then target 1 “Cyber Dragon” in your GY; Special Summon that target. Once per turn (Quick Effect): You can banish 1 “Cyber Dragon” from your hand or face-up from your Monster Zone; this card gains 2100 ATK until the end of this turn. If this card in your possession is sent to your GY by your opponent’s card effect: You can Special Summon 1 Machine Fusion Monster from your Extra Deck. Cyber Dragon Nova is a great Rank 5 Light Machine-type XYZ Monster with 2100 Atk and 1600 Def. There are so many ways to get 2 Level 5 machines these days that it might as well have been any 2 Level 5 monsters, but Machine makes it restrictive enough to not be everywhere. Nova goes into Infinity, which is reason enough for a 4 out of 5. In Cyber Dragons you can revive a Cyber Dragon from the grave at the cost of 1 material. You can also banish a Cyber Dragon to gain 2100 Atk. Finally, if Nova is sent to the grave by an opponent’s card effect you can Special Summon any Machine Fusion Monster from the Extra Deck. All 3 effects are good, but the unlisted one is best. The ability to go into Infinity without altering the Main Deck is perfect while not being broken. All that being said, I like this artwork better than Infinity. 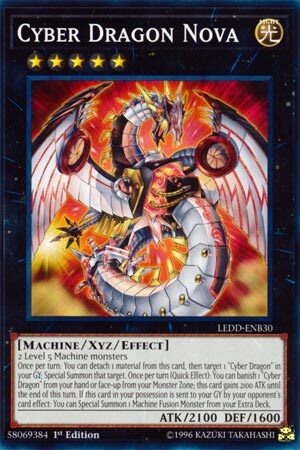 Cyber Dragon would of been obvious for Throwback Thursday and while it is a great card, it is very simple as well and I decided to look at a card that does a bit more, so Throwback Thursday this week looks at the first of the two Cyber Dragon XYZ monsters, and what most players that don’t play Cyber Dragons know as the card you put under Cyber Dragon Infinity, Cyber Dragon Nova. Nova is a Rank 5 LIGHT Machine XYZ with 2100 ATK and 1600 DEF requiring 2 Level 5 Machine monsters. Stats are fine on a Rank 5, especially for the Cyber Dragon archetype, but if you are using this just for Infinity you don’t care for stats. LIGHT and Machine are great and the summoning requirement is easy enough for Machine decks considering there are a plethora of Machine decks that run Level 5 Machines. Once per turn, you can detach a material from this card to target 1 Cyber Dragon in your GY and Special Summon it. Again, there are a plethora of Cyber Dragons that treat themselves as the original Cyber Dragon in the GY, including Cyber Dragon Sieger which has arrows that make it good in the Extra Monster Zone or Main Monster Zone. Once per turn as well, but this one is a Quick Effect, you can banish 1 Cyber Dragon from your hand or face-up on the field to have Nova gain 2100 ATK until the end of this card. This can be great to push for an OTK or prevent your opponent from running over Nova so you can potentially revive another Cyber Dragon. Finally, if this card in your possession is sent to the GY by your opponent, you can Special Summon 1 Machine Fusion from your Extra Deck. Some decks that just use this for Infinity ran the Level 12 Roid Fusion just in case the opponent negated the Nova summon or destroyed it instead of waiting for Infinity, which really puts pressure on the opponent when the Nova comes out before the Infinity. In Cyber Dragons, you might be running some more options. Chimeratech Rampage Dragon is good even though you won’t get the effect on summon to pop Spells or Traps since you didn’t use Fusion Materials to summon it. Cyber Twin Dragon can be nice to get double attacks in with a 2800 body, or you can go for Cyber End Dragon to get a 4000 ATK piercer. Cyber Dragon Nova is great in the Cyber Dragon deck and not just for summoning Infinity, it is a must a 2 in the Cyber Dragon Extra Deck cause it is so good for the archetype. Art: 4.5/5 A much more advanced Cyber Dragon we have here, looks awesome. Cyber Dragon Nova is our Throwback Thursday, appropriately enough this week. Nova is a Rank 5, Light attributed, Machine type XYZ Monster, with 2100 attack and 1600 defense. I think we’ve seen those stats before. Light and Machine are great, obviously, and this guy is fairly splashable. I would recommend running Machines (not Cyber Dragon per say) to take full advantage of this card, however. But, as said, I think he could work outside Machines as well. This is honestly an instance you could just run Cybers with this in a Machine variant, or out of. You only need two Level 5 Machines for this XYZ Summon, so it isn’t difficult to accomplish. Once a turn by discarding an XYZ Material, you can target a Cyber Dragon in your Graveyard and Special Summon it. So that’s useful, another Monster is good, and can speed up an Extra Deck Summon. You can also remove a Cyber Dragon from your Hand or face-up from your Field from play to have this card gain 2100 attack. Only until the End Phase, but that’s still 4200 attack total for a turn. If this card is destroyed by your opponent’s card effect and sent to the Graveyard, you can Special Summon a Machine Type Fusion Monster from the Extra Deck. Also a very welcome bonus to a solid card. This card has been out for a while, but it is much better given the new support the Cybers have available now.